The shape and size of a woman's breasts change a number of times in her life. This is mainly due to fluctuations in weight, sport, pregnancy, contraception, medication and diet. That is why at Patricia of Finland we recommend that our customers are fitted every 6 months. 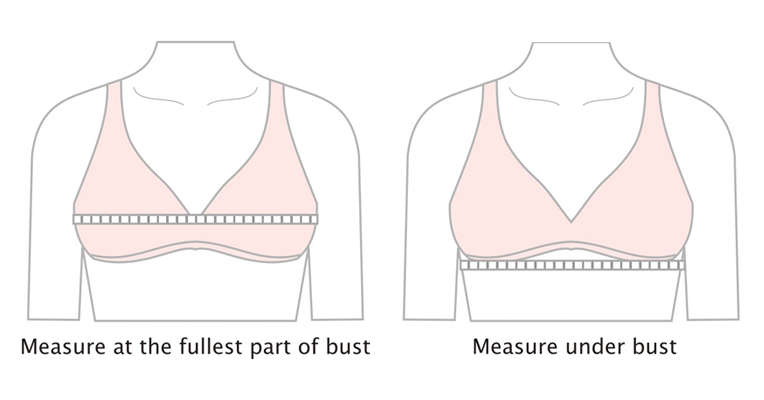 Standing in front of a mirror, wearing a non-padded bra and using a soft measuring tape, bring the tape across your back at band level, under each arm, around the front and measure just above the bust (a good guide is where your bra strap meets the bra). Measure completely around the fullest part of the bust being careful that the tape isn't too tight and binding or too loose and pulled away from the body. With the tape in position, take a breath in and out, allowing it to slide to its most comfortable fit. TIP: lf the measurement falls on the half inch, round up!